Patagonia designed their PowSlayer the same way they choose their boards—for the details. The uncompromised PowSlayer provides the highest level of stormproof performance available so you can focus on riding rather than second-guessing the weather. Made with zero limitations, the PowSlayer is built from extremely light, yet highly durable, 3-layer 100% recycled nylon ripstop Gore-Tex® Pro fabric for the pinnacle of waterproof/breathable and windproof protection. A DWR (durable water repellent) finish increases durability and prevents wet-out in soggy, spitting conditions. The helmet-compatible, 2-way-adjustable hood has a laminated visor for optimal visibility and a Cohaesive® cord-lock system, which embeds cord locks into the hood and hem to eliminate loose ends. Watertight, coated slim zips reduce weight and bulk; pit zips quickly release your heat. The low-profile, fully adjustable powder skirt has a webbing loop to connect to any Patagonia® Snow pants and holds tight for snorkel-deep sessions. 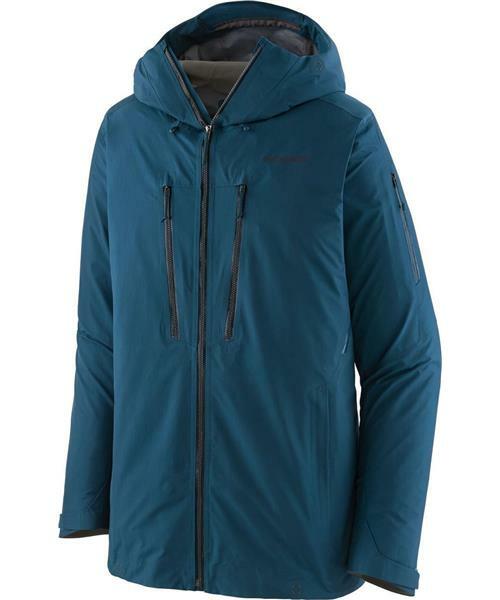 Pockets include two chest (one with a secure media pocket and cable routing); two handwarmers; one arm pocket for your pass; two internal drop-ins; and one internal stash pocket. Includes an embedded Recco® avalanche rescue reflector. Updated this season with improved symmetrical styling.